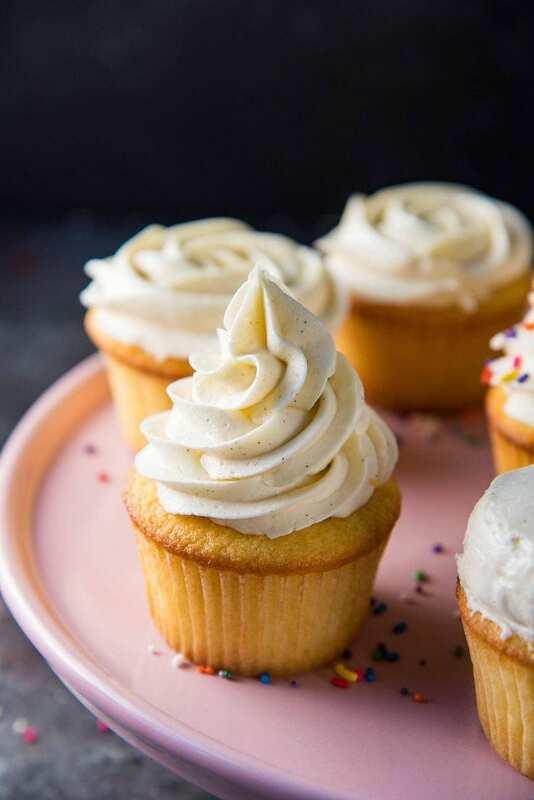 This Perfect Vanilla Buttercream Frosting is creamy, fluffy, melt-in-your-mouth soft and is packed with vanilla flavor without being overly sweet! And it’s simple. 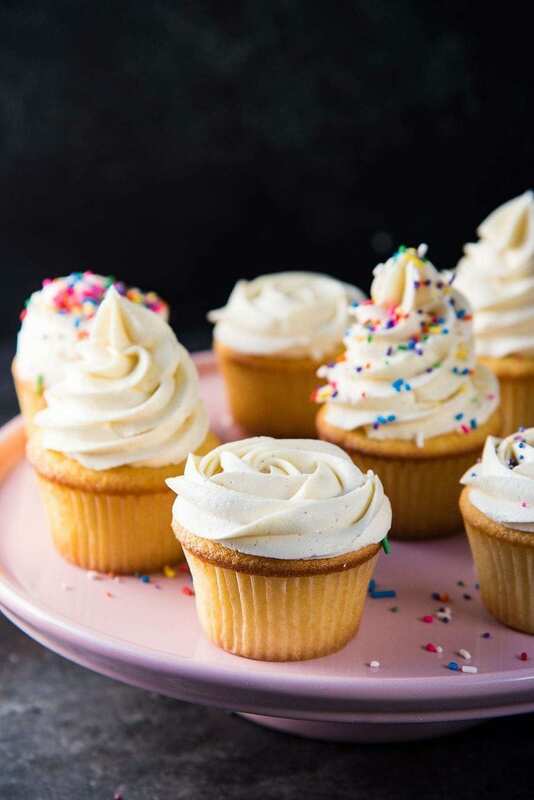 I’ve also shared tips and tricks that I have for making consistently great vanilla frosting for all of my baked goods and desserts! 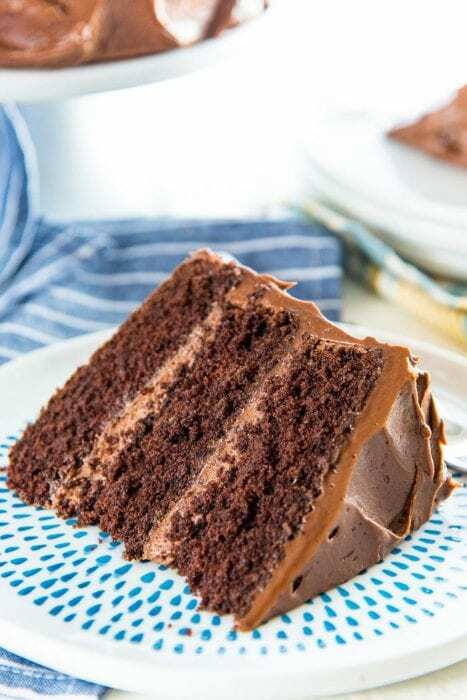 If you’re looking for chocolate buttercream instead, Click HERE to get the recipe for Easy Creamy Chocolate Buttercream Frosting! Today’s recipe for Perfect Creamy Vanilla Buttercream Frosting is deceptively simple, but it’s one that can go wrong in so many ways! So here I’ll be sharing all the tips and tricks that I use to make consistently AMAZING vanilla frosting. It’s only my second favorite frosting (everything comes second to chocolate! ), but I make it all the time, and I’m not at all shy when it comes to slathering it all over any cake! It’s important to whip the cool butter until it’s light and fluffy as the first step. This vanilla buttercream frosting ticks all of these boxes! Add the vanilla, salt and cream and whisk/whip the butter further to make it light and fluffy. The main reason why buttercream frosting recipes go wrong for people is actually because they follow the recipe to the letter! 🙂 With buttercream frosting, a recipe is only a guide because the ambient temperature plays a HUGE part in the final result! So you need to learn how to adapt your recipe to get consistently fantastic results! Most recipes call for room temperature butter for any kind of buttercream frosting. Here’s the problem with that – not everyone’s room temperature is going to be the same, and it’ll be different depending on the season, and so on. So if you make your vanilla buttercream frosting with butter that was softened at a warmer temperature, you’ll end up with buttercream that’s too soft. Then you have to add extra confectioner’s sugar to make it firmer, and that ends up making your frosting too sweet. Whisk the buttercream further once the confectioner’s sugar has been added. Cool butter. I don’t mean that your butter needs to have swag. Just that you need to start with butter that’s cool to the touch and very slightly softened. 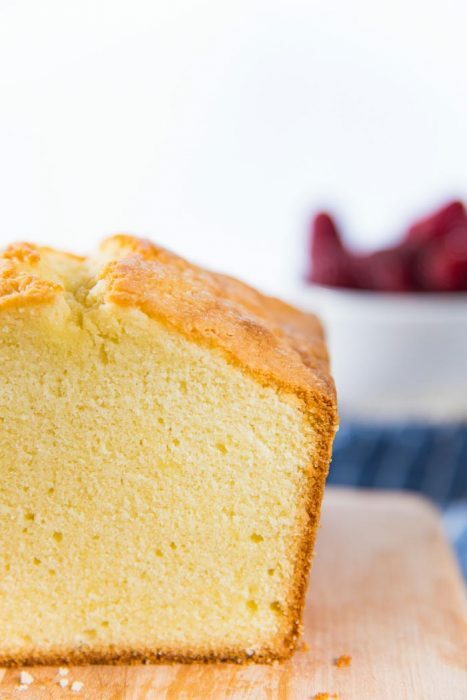 This way you’ll have to whisk it longer to make it creamier, BUT it will hold its shape a lot better than when making frosting with butter that’s warmer and too soft. Use a 1:1 ratio (weight-wise) of butter and confectioner’s sugar. This gives me the best level of sweetness. Some recipes call for 1:2 ratio of butter to sugar, but I find that to be way too sweet! But if you do like a sweeter vanilla frosting, you can add UP TO twice the amount of confectioner’s sugar as butter, if you like. Cold cream. 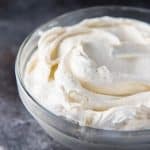 cold, whipping cream not only adds a creaminess to the frosting, but it also helps regulate the temperature of the frosting. The cream whips along with the butter, making the buttercream lighter, fluffier and creamier. Good quality vanilla. I use Madagascar bourbon vanilla in my frosting, but I LOVE using vanilla bean paste too. There’s just something more delectable about seeing those flecks of vanilla bean caviar in the vanilla frosting. Another trick that I like to use with my vanilla frostings is the use of TWO TYPES of vanilla! I like using Madagascar bourbon vanilla for flavor, and then I add a little bit of Tahitian vanilla for that sweet vanilla fragrance. This is completely optional though. Most recipes add vanilla extract at the end of the recipe. There’s no reason for this. You can add vanilla at the beginning AFTER the butter has been whipped if you want. The only reason I would add it at the end , is so that I can taste the buttercream and add more if I want to. The way I make sure that the butter is at the right temperature is pretty simple. In the summer, I take out the butter from the fridge and let it rest for a little while until it’s slightly soft, but cool to the touch. This could take up to about 30 minutes. In the winter, I keep the butter out overnight because it’s cooler inside the house (even if your thermostat is set to the same temp. all year, it’s still colder inside the house in the winter due to things like heat radiation and the dry air), so the butter stays nice, cool and perfectly soft until the next day. If you have a sugar thermometer, you can actually measure the butter temp., and you need it to be at about 70°F (21°C). This is optional though, so as long as the butter feels cool and slightly soft to the touch, it should be good. 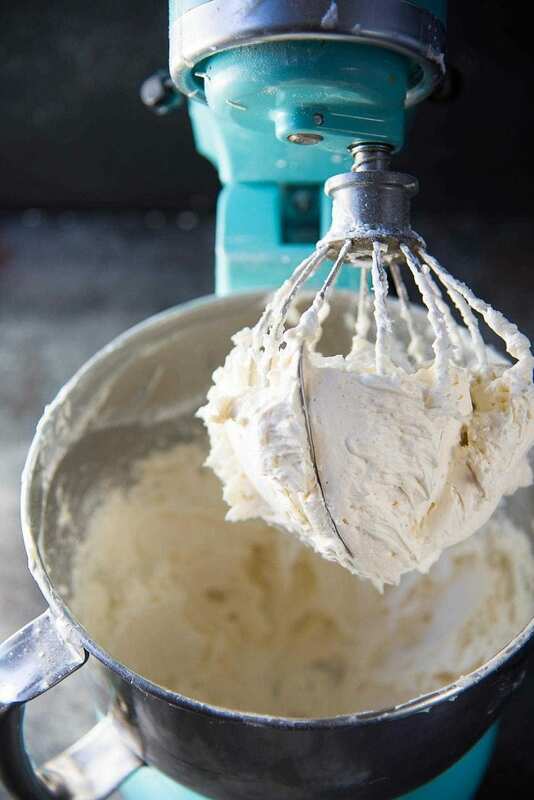 Whip the cold butter in a stand mixer until it’s creamy and turns white in color. It’ll take a bit longer than it would with softer and warmer butter, but it’s certainly worth it because you end up with delightfully soft, creamy buttercream that pipes beautifully. I like to add 1/4 cup of the cream at the beginning with the butter, so that the cream makes the butter lighter and fluffier. However, I always keep some extra cream to add at the end, just in case I feel like that frosting could use a little extra creaminess. During hot, summer days however, I avoid adding extra cream to prevent the vanilla frosting from becoming too soft. 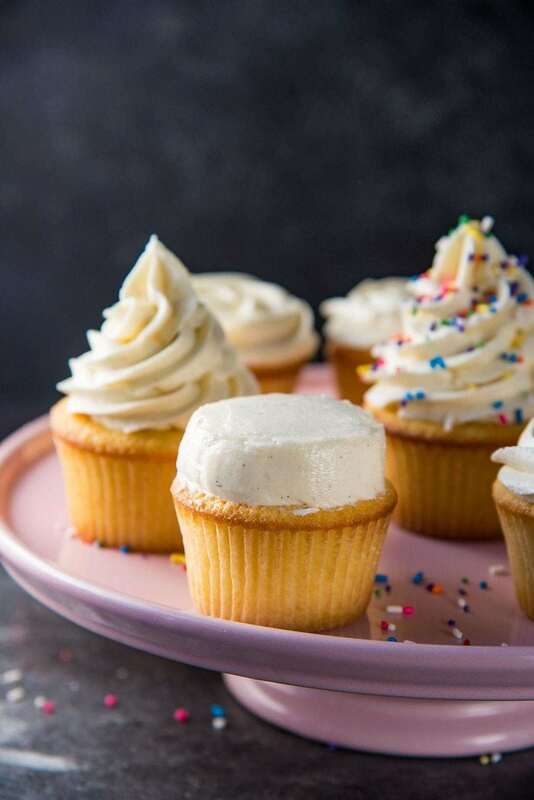 If you love Vanilla cake to go with your frosting (Like these vanilla cupcakes or a basic vanilla cake), you can get the recipe by clicking here. I’ve shared all the tips I use to get perfect vanilla cake (or cupcakes) with every step! 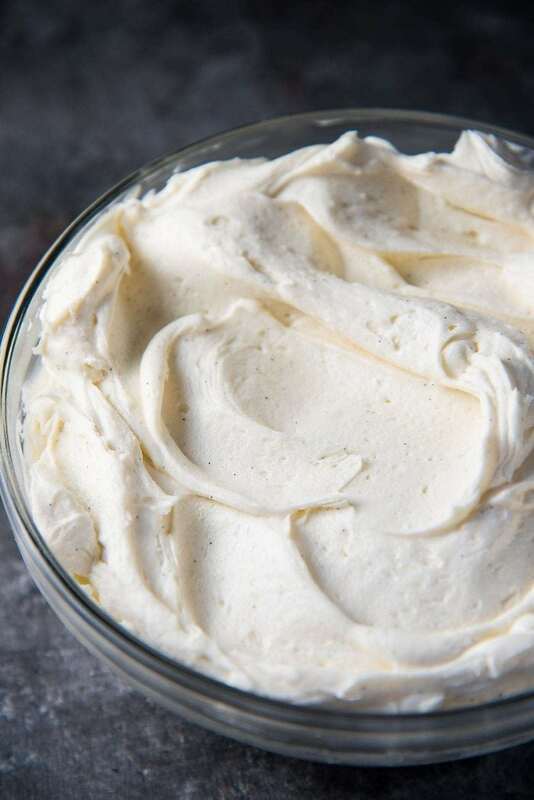 You can store this vanilla buttercream frosting for a day or two as well. Just cover the bowl tightly with plastic wrap and store in the fridge until needed. BUT, make sure to let the frosting soften slightly and then whisk it until it’s creamy again, before using it. This vanilla frosting can be colored too! Just add some gel food coloring to get the colors you want. You can make this beautiful pastel colored vanilla buttercream with just a few drops of color! 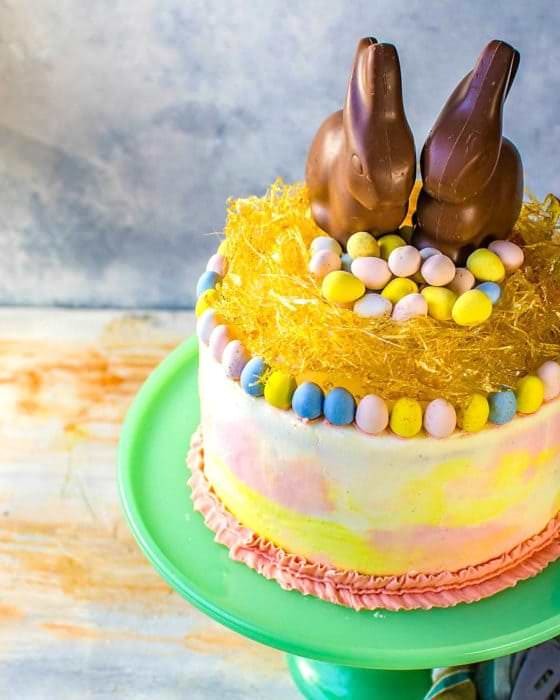 Get the recipe for this Chai and Vanilla Easter Cake. 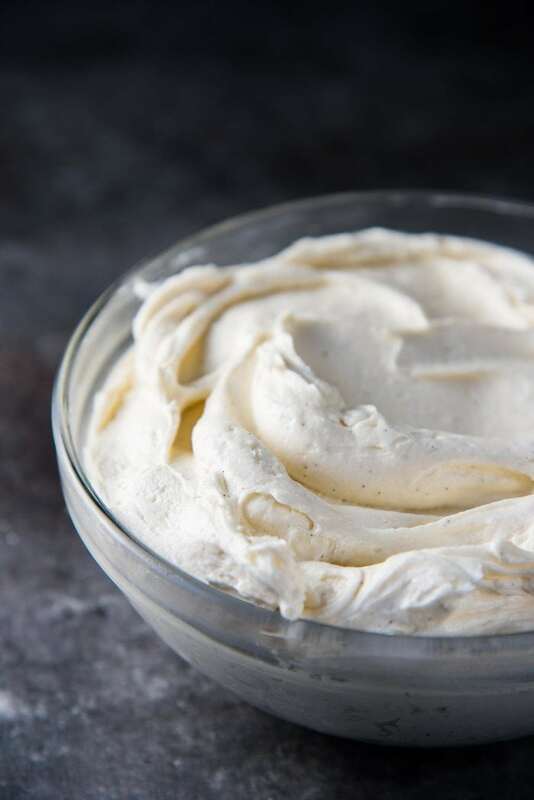 If you liked this vanilla buttercream frosting recipe, don’t forget to subscribe for new (and free) recipes by entering your email address on the side bar (and get all these recipes delivered straight to your inbox), so you don’t miss out on a thing. You can find me on FACEBOOK, TWITTER,INSTAGRAM, PINTEREST, YOU TUBE and GOOGLE-PLUS too. Place the butter in the bowl of a stand mixer. With a whisk attachment, whip the butter until it's creamy and white in color - about 3 - 5 minutes on high speed (not maximum speed). Add the salt, cream and vanilla, and whisk further until the butter-cream mix is light and fluffy (for a few minutes). Lower the speed and add 8 oz of the confectioner's sugar - a little at a time, and incorporate all the sugar into the butter. Make sure to scrape the sides as you go. Once the sugar is incorporated into the butter, increase the speed and whisk on high for 1 minute. Taste and add the rest of the confectioner's sugar if needed. Whisk for a further 2 - 3 minutes until you have a light, fluffy, soft, spreadable frosting. If the frosting is too stiff, you can add extra cream (1 tbsp at a time) to get an even softer buttercream. 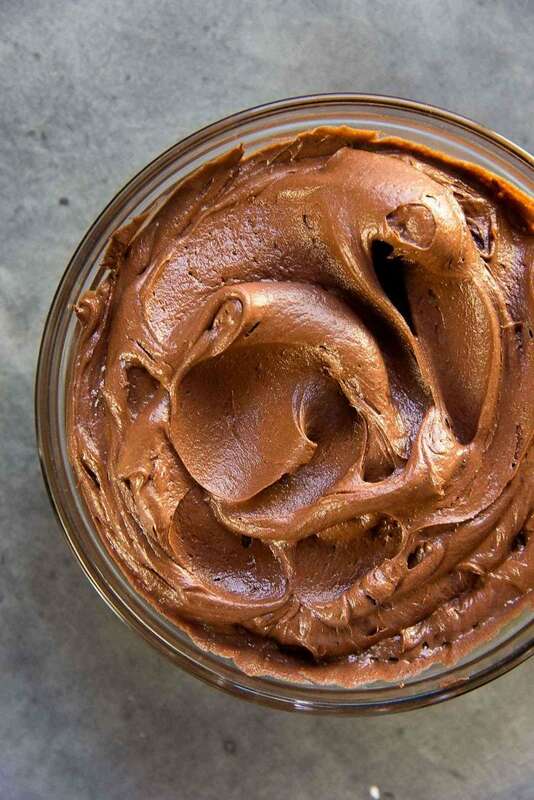 Now you can get the recipe for the creamiest Chocolate Buttercream Frosting too! 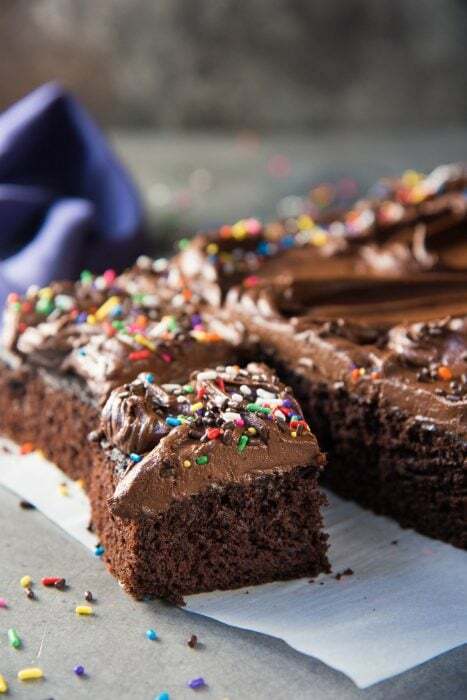 How about this Fudgy One Bowl Chocolate Sheet cake recipe? can I use this frosting recipe to make roses? This is pipeable, but not too stiff for roses or flowers. I usually like to use a stiffer buttercream for piping flowers. You can make this buttercream stiff to your liking, by adding more confectioner’s sugar. It will also make it sweeter though. Hope that helps! I have been so disappointed in buttercream recipes, and this is perfect! Thank you! So glad you liked the frosting recipe J! Thanks so much for letting me know! So, just verifying butter and sugar ratio in the recipe. 2 sticks of butter to 1 cup of powdered sugar? Seems like it would be overly buttery and not sweet enough. I am looking for a not too sweet vanilla frosting for my daughters birthday cake …. thanks for sharing the recipe. Yes you can use cream cheese, but the frosting won’t be as soft then. How long can this stay out at room temp once it’s made given there is cream in it? That should be fine! Make sure the cream is chilled, and add a little at a time to make sure the frosting stays creamy. I hope that helps! This recipe is just enough to frost an 8 inch cake. You could frost a 9 inch cake but it will be a thin layer. I would recommend making 1.5 times the recipe for a 9 inch cake (or double it if you want to do frosting decorations). I hope that helps! Hi Dini, thanks a lot for this recipe! Usually frosting splits when the frosting is too warm or it was over-whisked or the butter was too soft. All of these things result in the butter and/or the cream splitting, causing the grainy separation. You can fix split buttercream by keeping the frosting in the fridge for a little while to firm it up a bit, and then take it out and whisk it again (with a paddle attachment). Once the butter in the split buttercream solidifies, it can be re-whisked to an emulsion again. You can also add some extra confectioner’s sugar as well if it doesn’t work. I have added cream after confectioner’s sugar many times, and it hasn’t split for me, so it shouldn’t matter if you do add the cream at the end. Although, if the frosting seems too soft even after adding confectioners sugar, I don’t add cream to prevent the frosting from splitting. I hope these tips help. Let me know if they work! Looking to try this, but also want to try and make it naturally pink with added strawberries… how do you recommend i do that? Can i just puree strawberries and add it in? I’ve made strawberry, cherry and raspberry buttercream before – I would add between 1/4 – 1/2 cup of the fruit puree to the buttercream until I get the taste that I like. However, please bear in mind that adding fruit puree does make the frosting runnier too. So you need to add 2 tbsp cornstarch to the frosting and whisk it in, followed by extra confectioner’s sugar until you get the consistency you like. You can add about 1/2 tsp of lemon juice to make the berry flavor more vibrant too. How many cupcakes does this ice? I need to ice 12. It depends on how you want to frost your cupcakes. 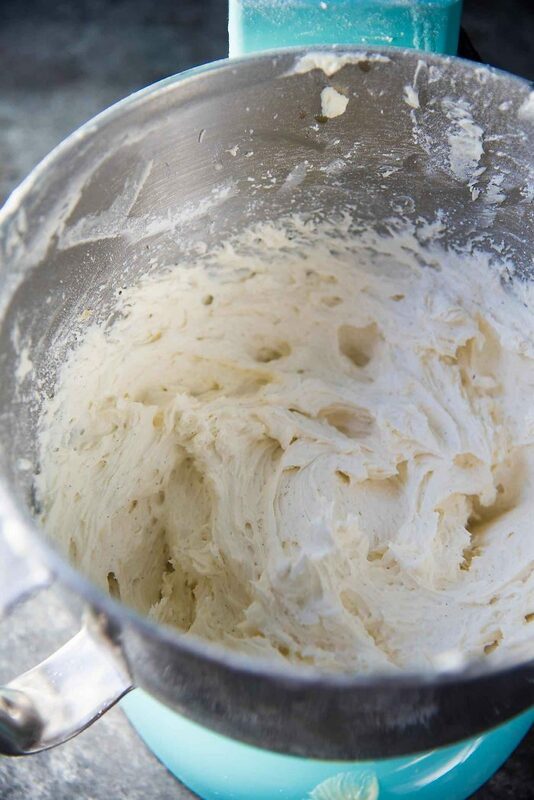 If you want big swirls on your cupcakes, you may need 1 1/2 – 2 batches of this frosting. If you only want a thin layer of frosting, then this will be enough for 12 cupcakes. If I frost a birthday cake the night before, and we eat it around lunchtime the next day…is it ok to leave out? I’ve had bad results refrigerating homemade cake, it gets very dense in texture and not springy like when I baked it. Yes, if you’re having it the next day, then it’ll be totally fine to leave it out. The frosting will also help keep the cake moist and springy. Is the whipped cream necessary or can i substitute it with something else. I personally don’t make vanilla buttercream without cream (unless I want a crusting buttercream or a stiff buttercream). The whipped cream makes the buttercream that much creamier. But if you want, you can substitute with some coconut cream (but less than the amount of whipped cream). 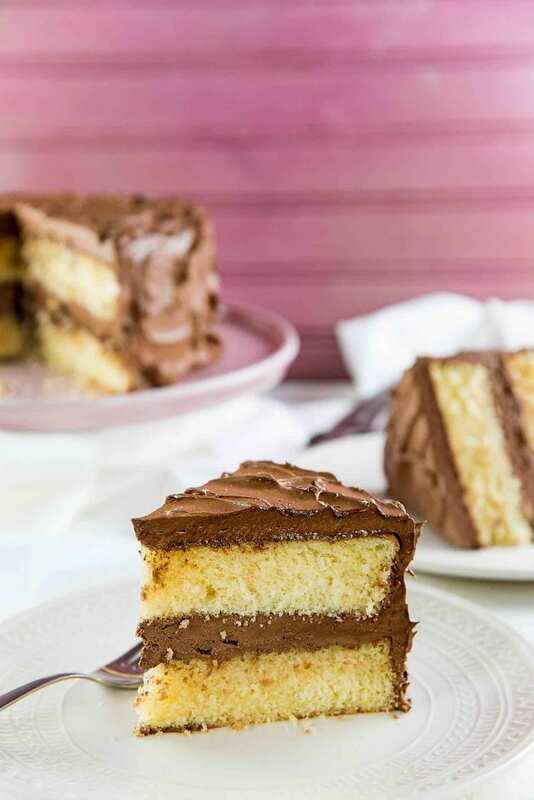 Or if you prefer to opt out of it completely, then I would recommend adding less confectioner’s sugar to prevent the buttercream from being too sweet or too stiff. I hope that helps! Okay, I’m fairly new to baking and I have been using shortening to make my buttercream and find that within a few hours my buttercream is stiff and cracking. I will do as you suggest and use the whipping cream. Buttercream made with shortening will crust. When crusting buttercream is called for certain cakes, I always mix shortening with my butter to get a crusting buttercream. 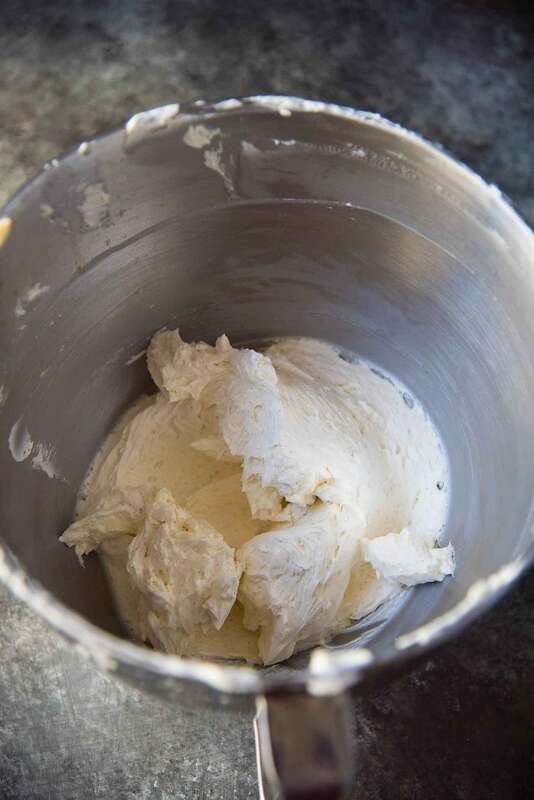 Using butter for your buttercream will add more flavor, and will be creamier (and softer) than a shortening buttercream. The addition of cream will make it even more creamy. But with no shortening, it will not form a crust or be stiff. It does, thank you :). Is this a crusting buttercream? This isn’t a crusting buttercream. To make it into a crusting buttercream, you will have to replace at least 1/2 of the butter with shortening. The more shortening in the buttercream, the more likely it is to form a crust. Thank you so much for these valuable frosting tips. I always kind of “winged it” when it came to making frosting, but this post taught me a lot! Love the vanilla flecks here, delicious frosting. This is the best frosting recipe i have used. I love that it is creamy but not so sweet that you can only eat a tiny bit. Hi, i’m hoping to use this to fill and ice a three tier 8 inch cake, is this enough or would i need to double? I made this recipe to generously cover a two tiered 8 inch or 9 inch cake. You may need a little more frosting to generously fill and cover a 3 tiered 8 inch cake. 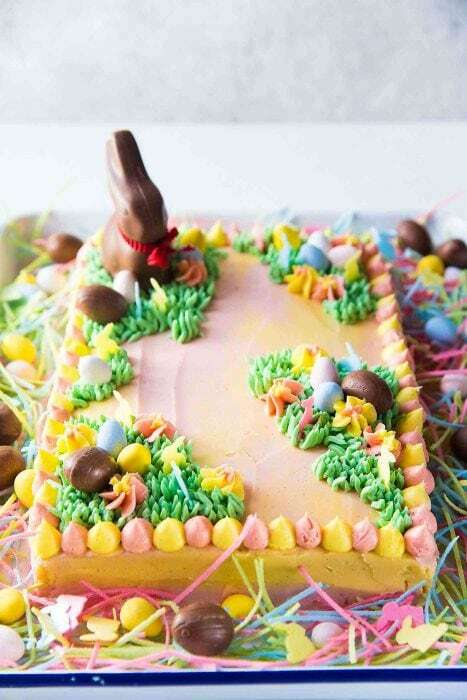 You could make a double batch, and use the extra to decorate the cake, or make 1 1/2 batches.